The divers descended 410 feet (125 meters) into dark Mediterranean waters off Italy, their lights revealing the skeleton of a ship that sank thousands of years ago when Rome was a world power. A sea-crusted anchor rested on a rock. The ship's cargo lay scattered amid piles of terra cotta jars, called amphora. 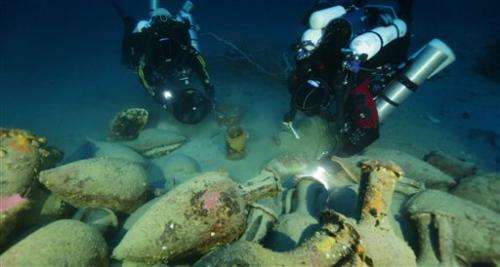 Highly trained technical divers with a Florida-based group called Global Underwater Explorers—GUE for short—are helping Italian researchers to unlock an ancient shipwreck thought to date to the second Punic Wars between Rome and Carthage. Able to descend hundreds of feet (meters) further than most divers, they aide the archaeologists by swimming about the wreck fetching artifacts—as no robotic submersible can. On this dive, they swam past the large amphora used to carry wine, olive oil and other cargo on Mediterranean trade routes centuries ago—feeling as if they were transported to another time. "It felt very much like a ghost ship awaiting the boarding of ancient mariners," said Jarrod Jablonski, one of the divers with the Florida exploration group. Many of these divers honed their deep-water diving abilities in Florida's labyrinths of underwater caves. Now GUE provides the technical divers needed access to cargo and other artifacts from a ship thought to have sailed around 218-210 B.C.—when Rome and Carthage were fighting for naval superiority in the Mediterranean. Archaeologists said the ship is a wooden vessel about 50 feet (15 meters) long that could have hit rough seas and broken up on rocks before plunging to the sea bottom—possibly a wealthy merchant's cargo ship or one used to supply the Roman military. "This shipwreck is a very important occasion to understand more about daily life on the ancient ship as well as the real dynamics of ancient trade," said Sebastiano Tusa, an Italian archaeologist who is studying the site. "Of course, there are other similar shipwrecks that can offer similar study cases. But this has the peculiarity to be in a very good preservation condition." As Jablonski and seven other GUE divers explored the wreck in September, Italian archaeologists shadowed them in a small submarine, shining a bright light on the trove of Greco-Roman artifacts. As researchers in the sub pointed to objects, the divers retrieved them, swimming to the sub's window for viewing. A thumbs-up, and the items were attached to balloons and sent to the surface. Nitrogen becomes increasingly toxic to humans below 100 feet (30 meters). Divers below 200 feet (60 meters) experience feelings similar to becoming drunk, making working with tools or fragile objects clumsy. But the GUE divers use specially prepared mixes of gases, which eliminate the problem of diving so deep. But the gases must be balanced carefully at each depth, or they could die or become extremely sick. "Technology hasn't substituted the human hand, with its articulated five fingers, for uncovering and cleaning artifacts," Jablonski said, explaining why they make these risky dives for researchers. "The fact that they are diving in that deep water, it is pushing the limits of the technology in a way I welcome very much," said Felipe Castro, a professor of nautical archaeology at Texas A&M University not with the project. The divers found many important pieces needed to tell the ship's story, said Alba Mazza, an Italian archaeologist with the University of Sydney in Australia. Of note were the ship's anchor and a sacrificial altar with Greek inscriptions that provide clues to the ship's origin. The size and shape of the amphora help them understand what the ship was carrying. 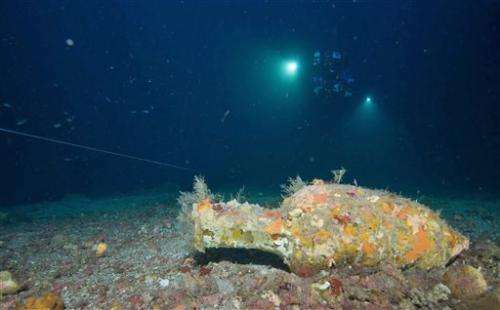 Experts believe it could have been a supply ship for Roman legions or that it belonged to a wealthy merchant, possibly from the Italian region around Naples, which Mazza described as "very rich and wealthy, with lots of nice wine in that area." GUE divers were paid through corporate contributions to its "Project Baseline," an endeavor in which divers and citizen scientists throughout the world submit data from myriad underwater sites that future researchers can use to compare and track changes. In addition to working on the wreck, Project Baseline divers around the world are surveying reefs and caves, including a deep sea cave off France. In the case of the Panarea III shipwreck, the data collected from the site can be used by the Italian government or others in the future. "Reaching the dive site was a mystical experience and very much like reaching through a window in time," he said.